Way too low a Ctedit Limit. I have ZERO missed payments EVER on a CC. I got a ridiculously low 2,000 limit. Not much buying power. I have had the card over 18 mo and thye hae not given me ONE increase in Credit limit. SO I asked for an increase on their web site-and they relied "Sorry you have not USED your card enough to warrant an increase" Really? Why am i USING it with a really low Credit limit--Cant buy CAR, cant even REPAIR my car with 2,000 limit. Just too much WORK to get a higher credit limit compared to OTHER cards out there. And they process Payments VERY BERY SLOWLY up to 12 days for a check to Clear. You're mad because they didn't increase your credit limit when you showed them no proof that they should do so because you didn't use the card at all? I'm not sure if this is an entitlement issue, but as you can see, everyone who USED the card was offered a limit increase and didn't have to seek out the increase themselves. Also, and this is a serious question, what kind of damages is your car taking that it can't be repaired with $2000? Capital One by far has one of the best customer service experiences. I now have two cards through them. My credit score when I applied for this card was about a 650. My starting credit line was at $1,000 and I made 5 consecutive payments and my credit line was bumped up to $1,500. I got this card when I started college with a $300 limit and am wrapping up my senior year now with a $1800 credit limit which is nice given that I've been living on student loans without other income. Great way to buld credit for students. It gets a low entry score up quick! Approved for 500. Rose to 8000 after 2 months with a 709 score after 2 months. You get an additional .25 cash back at the end of the billing cycle ! It’s a great card to have. No issues so far ! Did applying for this card effect your credit score much? Don’t waste your time with this company. I was approved for this card back in 2012. Four years ago, a boyfriend had somehow been added to my card because capital one pulled up my account with our address. Once finishing out his card was canceled. Fast forward to last summer and that same guy, now an ex, somehow was able to use that canceled card and ran up a $500 bill. Found out about it and called Capital One to report the fraud and they canceled BOTH my credit card accounts and left me with the bill. Destroyed my credit and let some ******* off the hook with my pocket. DONT WASTE YOUR TIME ON THIS COMPANY. My credit was in the low 600's when i was approved for this card. Young dumb me took on more than I could handle in student loans in college so it chased me around for years, killing any chance at ever getting credit. Then this card came along! I was approved for $300 line, even with the defaulted loans. After making payments on time monthly, my limit was increased over time. With this card and paying off the loans, my score was able to climb very fast. Thank you for taking the chance on me to establish my credit as an older, wiser adult! The point is in the name....Journey. I ruined my credit--like many of us here, by being young and stupid. Got a credit card as a freshman in college, bought a snowboard, didn't pay it off, sent to collections, card closed...all that jazz. I got my score all the way down to 495. 495! I started rebuilding my credit in Feb. 2017. So as of this post we're at just alittle over 2 years. Capital One approved me when no one else would. They gave me a $500 starting limit and I made SURE to pay off the balance every month. I became obsessive about it, paying off a few days before the statement closed. Not long after I applied for the Capital One Platinum card, purely in an attempt to double my credit line. 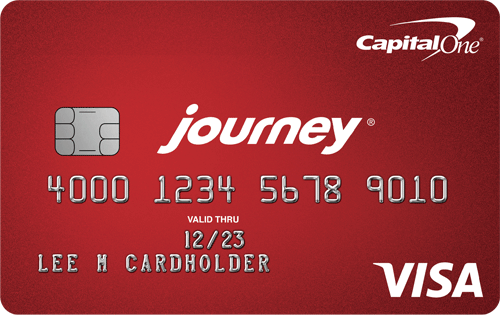 Capital One granted me gradual CLIs, and after about 6 months, I found a link that would upgrade my Journey to the Quicksilver, bumping my rewards rate by .25%. Then the offers started to come in. May 2017, Citi sent me a pre-approval offer in the mail, the Citi Double Cash. They offered me a reduced intro promo of something like 8 months of 0% as opposed to 18 months, but I was simply excited to receive the pre-approval for this mid-tier card. Having a flat rate 2% felt like luxury! My CL was only at $700 at the time, so it really felt like Citi saw me as risk, but also acknowledged that I had completely done a 180 degree as far as being responsible cardholder and were betting a chance. Now in 2018, I had multiple small CLIs and my total CL was around $2500. In May 2018, I was pre-approved for the Discover IT, $500 CL. I thought having the 5% rotating categories in combination with my Citi DC would be a great duo, as well as the excitement of an actual intro promo of matching all cashback made after the 1st year. At this point, I felt set. More paying on time, more small CLIs and by the end of 2018 I was at a total CL of $5900. Fast forward to TWO DAYS AGO...Chase sends me a PreQual for the Chase Sapphire Preffered! I was pretty afraid of it, having applied for the Chase Freedom Unlimited and being denied at some point last year. My end game was always the Chase Sapphire and wanted to start building points so that, when the day came that I got the CSP, I could transfer my points over for travel. My CSP SL? $8200! Way more than my total CL before. Minor note, I have banked with Chase for a long time, and have had an auto loan with them since last summer...I'm sure that played a role as my scores are around 670 accross the board now. TL;DR: Even though I don't use my Capital One credit cards now, I will forever recommend them to people starting out or on repair. It's because of Capital One and Credit Karma as well as my being responsible, that I am where I'm at today. My scores are still on the repair, but having a solid 2 year streak now is why I think Chase took a chance on me. Thanks Capital One and Credit Karma! It has been quite the Journey indeed. I hava question. I have credit karma do you suggest when i get a pre approved in the mail i sign up to improved my credit line? I was a 440 but have been repairing and rebuilding my credit. Im now a 624.